I’m not a liar, I promise. I know that in my croquetas post I mentioned that I hated frying, and I do, but I couldn’t pass this up. Last week I made about 200 gnocchi for A Taste of the Mediterranean; after photographing them, I boiled a quick batch for dinner with some leftover pesto and stashed the remaining 180 in my freezer, in individual servings. The idea for this snack came to me last Thursday at around midnight while studying for my Arabic exam the following day. If you follow me on Twitter, you’ll know this is not my first craving this week. For some reason, probably having to do with the endless hours I spend studying Arabic grammar, I’ve been craving everything from oatmeal raisin cookies, dates (the edible kinds), to tatter tots. I stopped conjugating irregular verbs for a second and thought about frying up some of the gnocchi I had in my freezer, but I didn’t. Instead I continued conjugating and waited until right after my test Friday afternoon to fulfill my craving. As you could tell from the mise en place photo though, I knew that one bag wasn’t going to be enough that afternoon. 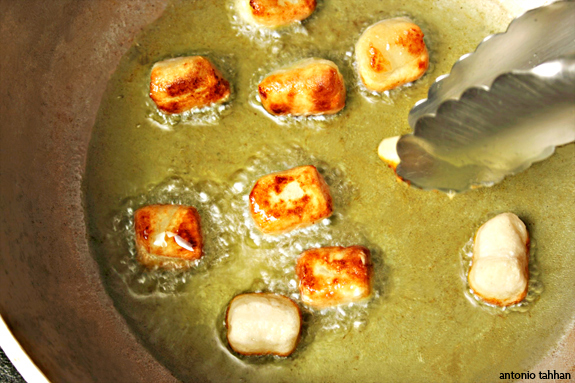 Once you start to plop the gnocchi into the hot oil they immediately begin to puff up like pillows. Fight the urge to nudge them around and you’ll be rewarded with beautiful, golden-brown nuggets of Italian deliciousness. As is my advice with all fried foods, also resist the urge to bite into the ones fresh out of the oil. I, of course, didn’t follow my own advice (again) and am typing this post with a slight tingly pain at the tip of my tongue. I was in no mood to go shopping or do extra cooking after my exam, so I opted for store-bought tomato sauce my roommate (who recently found out she is allergic to tomatoes) had in the fridge. Another sauce that would probably go well with these is the saffron aioli I made back in the day. 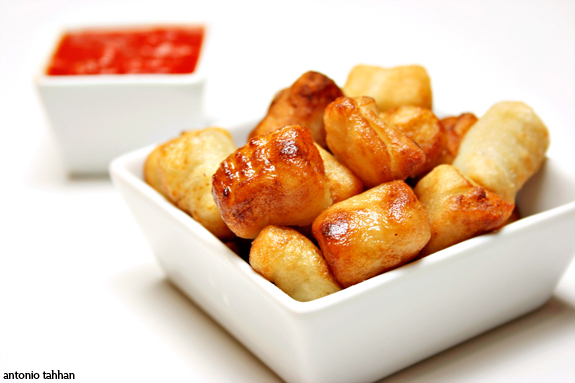 Fry the fresh or frozen gnocchi in small batches until golden brown on both sides. 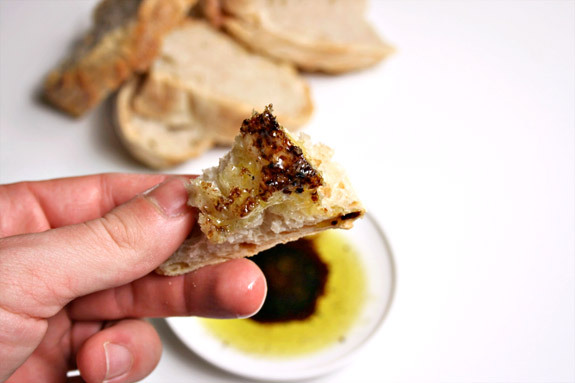 Move to a plate lined with paper towels to soak up any excess oil. Season with some salt, if necessary. Serve along side tomato sauce or saffron aioli. 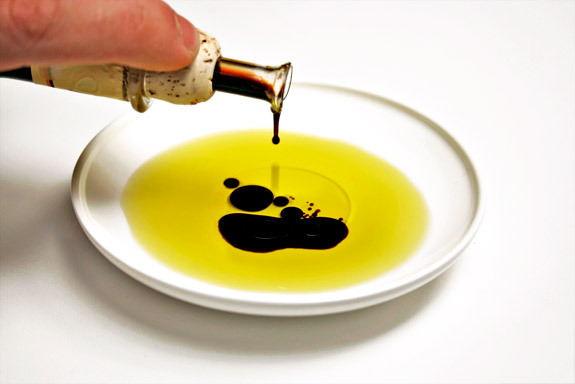 note: If you don’t have a thermometer and want to know if your oil is hot enough, stick the back end of a wooden spoon into the oil – if bubbles start to form on the spoon, your oil is ready for frying. I was able to wear a short sleeve shirt today without turning blue. It was bittersweet, however, because it made me realize that I’ve been remiss in blogging lately. Time does fly, but the truth is I started taking grad classes this semester and have literally been surviving off of cereal and my frozen batches of pastitsio that were supposedly reserved for “emergencies”. The pastitsio entries for A Taste of the Mediterranean were always a treat to read and an excuse for me to take a break from studying. So, to those who partook in lowering my gpa preserving my sanity, thank you. I’m happy to announce that the winner for February’s ATOM challenge is Joie de Vivre with her Lamb Pastitsio post! Make sure to check out all the creative pastitsio entries that were submitted, here. This month we’re featuring Italy with Francesco from The Food Traveller. When I e-mailed Francesco to ask him what he wanted to prepare for ATOM, his heart was set on gnocchi (neo-ki). Last Sunday to prepare for the contest, I set aside some time in the afternoon, put on my nonna apron and cranked out a few hundred of these soft cloud-like Italian dumplings. It was beautiful. Before I start raving about this Italian pasta/dumpling, I need to make a confession. Although I’m not proud of it, a few years ago I fell into the temptation of cooking store-bought “gnocchi”, if you could even call them that. The stuff that’s sold in the vacuum-sealed packages is often a dense, starchy imitation of the traditional, billowy pieces of Italian heaven. Nothing more than an impostor. As you can tell from the mise en place, the ingredients for this dish couldn’t be simpler. Ingredients that I’ll venture to say a good 80% of people (85% of foodies) already have on hand. If you try googling for a gnocchi recipe, you’ll find that everyone pretty much has their own version. You’ll find some that boil the potatoes, a few that bake, some will call for eggs, others will use ricotta – it all depends on who taught them to make their recipe. 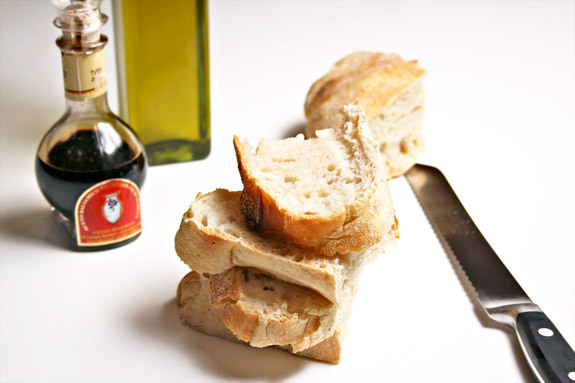 You’ll often notice this trend in Italian recipes depending on what was available in the different regions. The recipe that I use is one that I developed after trying different approaches to making gnocchi. This one boils the potatoes in the beginning, finishes them off in the oven and binds everything using an egg, and no ricotta. The reason why I boil and bake is because boiling the potatoes ensures that they do not dry out in the oven. I then finish them off in the oven for the opposite reason – to make sure that any excess moister gets evaporated. Once they come out of the oven, I peel and mash them to make something similar in texture to potato crumbles. If you have a food mill or a ricer you could use that to make sure you don’t over-mash the potatoes. Of course Italian grandmothers never needed these fancy gadgets to prepare their gnocchi; for them a fork and some old fashioned care was all they needed. 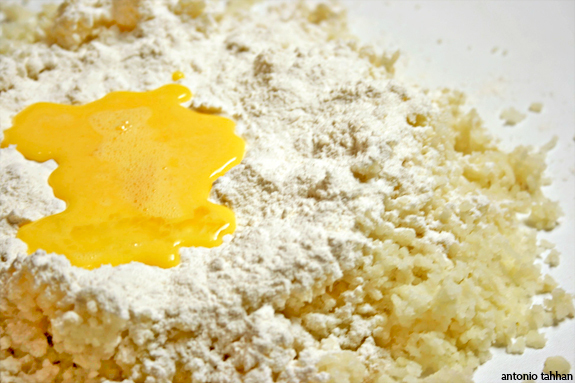 Once you get the potatoes mashed you’ll want to combine them gently with the egg and the flour to form the dough, making sure to never over-knead the mix. The good thing about these dumplings is that they freeze extremely well and still taste infinitely better than any of the stuff you’ll pull from off the shelf. I doubled my recipe and froze individual-sized portions to last me the entire month, experimenting with different sauce ideas. 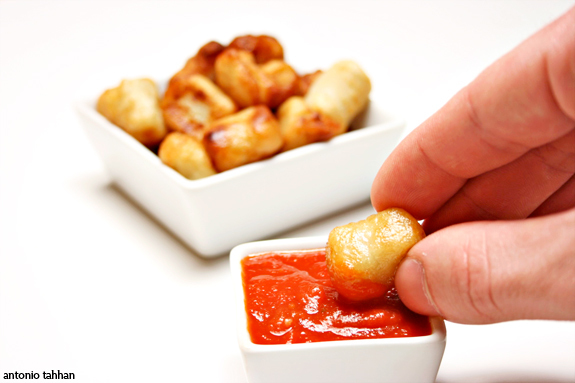 The sauce is why it is important to create the ridges on the gnocchi – not only will the gnocchi look more authentic/prettier, but they will also have more surface area to hold on to the sauce. 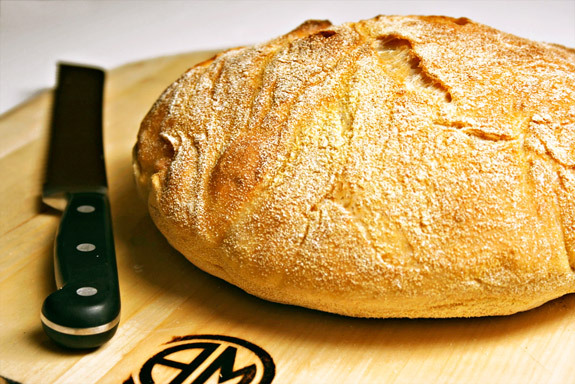 I can’t wait to see all the variations of gnocchi for A Taste of the Mediterranean – experiment with different doughs, sauces, presentations and submit your entry by March 31st for a chance to win a $50 gift certificate to igourmet! Boil your potatoes (with the skin on) for 30 minutes or until slightly undercooked. If you poke one with a sharp knife it should still offer some resistance. Transfer the potatoes to a 400 degree oven and cook for another 10-15 minutes. While the potatoes are still hot, peel them and mash them with a ricer, food mill or a fork (whatever you have on hand). Let the mashed potatoes cool. 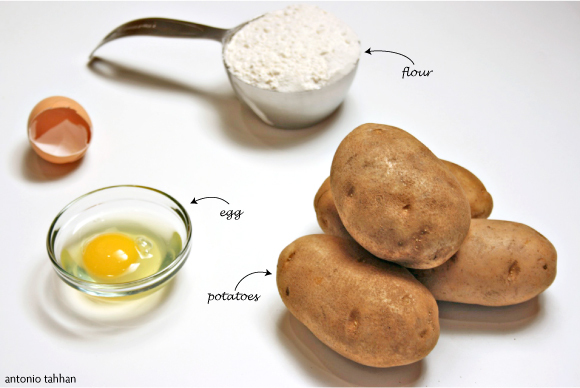 Create a well by layering the potatoes with 3/4 cup of the flour and the egg. 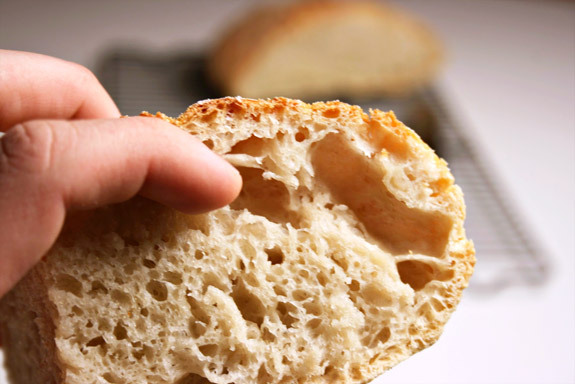 Start kneading the dough slowly and softly incorporating more flour as you need it. 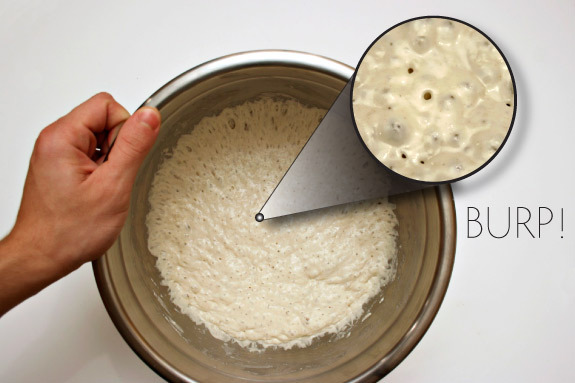 You’re looking for a soft dough that is still still slightly moist, but not sticky or tacky. 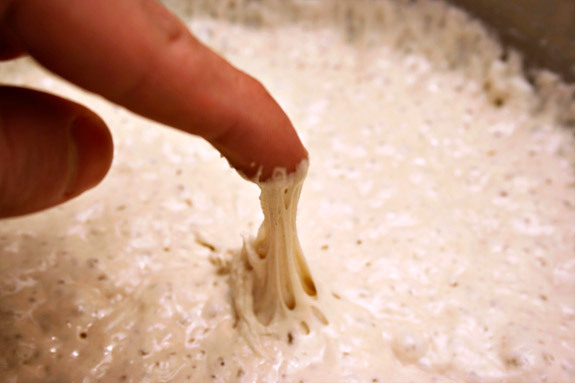 Cut the dough into four pieces and start by rolling the wedges into 1/4 in. diameter snakes. 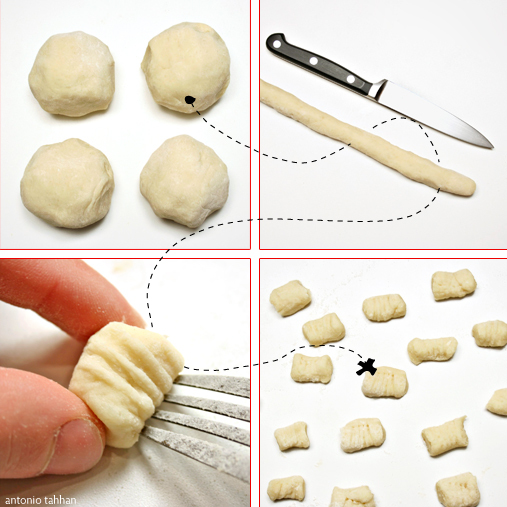 Slice every half inch and roll each gnocchi over the back of a fork to create ridges. Set aside on a sheet tray until ready to boil. note: To make sure the gnocchi remain light and fluffy try your best not to overwork the dough by kneading it gently. 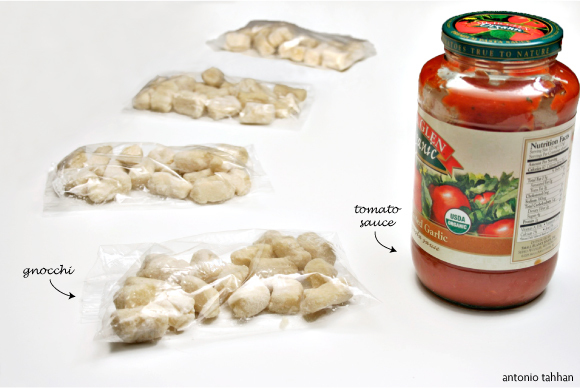 To freeze the gnocchi for later, freeze them first in a large sheet tray first for about 5 hours then transfer them to individual zip-lock bags for convenience.